Upon seeing the first golf course built in Pinehurst, founder James Walker Tufts was struck by how naturally the game fit into the landscape in front of him. “Golf experts and all those who cherish the hope of becoming such will find excellent opportunity to indulge in the game at Pinehurst,” Tufts remarked wistfully in 1898. On September 30, nearly 120 years after golf arrived at Pinehurst, the historic resort will open The Cradle, a nine-hole short course that even the newest to the game can enjoy. Designed by golf architect Gil Hanse, The Cradle, at 789 yards, features holes ranging from 56 to 127 yards. Mere steps from the Resort Clubhouse, it is the same area where, in 1898, Dr. Leroy Culver carved the first nine holes out of the sand at Pinehurst. Over the next century, Pinehurst came to be referred to as the Cradle of American Golf. Hanse’s design incorporates the native sandscape and wiregrass common to the original courses of Pinehurst. 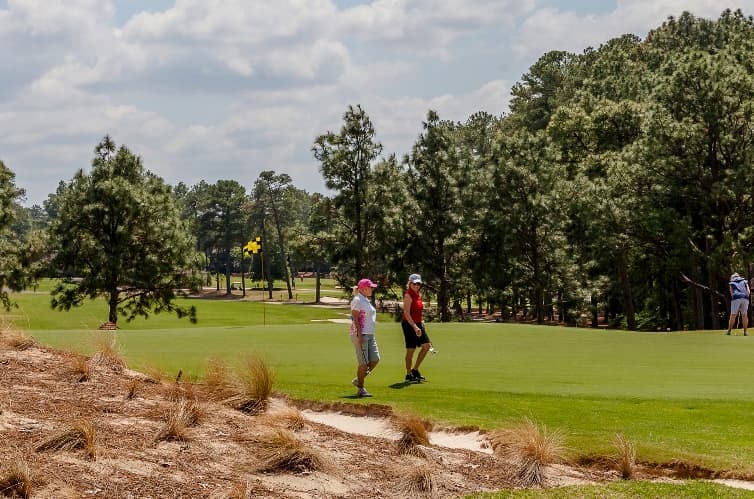 With holes that meander along the rolling terrain, The Cradle’s greens subtly blend into the surrounding landscape and are protected by rough-hewn bunkers, all features that have long been hallmarks of Pinehurst golf. Kids 17 and under play The Cradle free when accompanied by a paying adult, and The Cradle will be open to the public. Greens fees for The Cradle are $50 this fall, and will vary seasonably. Kids 17 and under play free when accompanied by a paying adult, and resort guests may book tee times in advance. Public tee times are available 24 hours in advance. Tee times can be made by calling 1-800-ITS-GOLF. Bordering The Cradle will be Pinehurst’s expanded putting course Thistle Dhu, which surrounds the Putter Boy statue. At 75,000 square feet, the new Thistle Dhu is four times larger than the original putting course built in 2012, with rolling hills and sweeping valleys sure to delight golfers of all kinds. Thistle Dhu, which will open in early October, will be free to play. The Cradle logo features the Golf Lad, an iconic figure featured in original advertising for the resort and most recently used in the logo for the U.S. Opens and U.S. Amateur Championships at Pinehurst. In the Cradle logo, the Lad is shown resting comfortably in the nook of the letter “C”. The opening of The Cradle and expansion of Thistle Dhu are two elements of a multiyear plan Pinehurst unveiled in November 2016. Following the successful opening of the Deuce, a new tavern overlooking the 18th hole of Pinehurst No. 2, Pinehurst announced it hired Hanse to build the short course and begin a redesign of Pinehurst No. 4. Hanse will break ground on the No. 4 redesign in October.